I know it’s a new year and some of us are three weeks into a new health regime. If you’re on any kind of kick where a delicious cookie would “ruin” anything, just pass this post right on by. 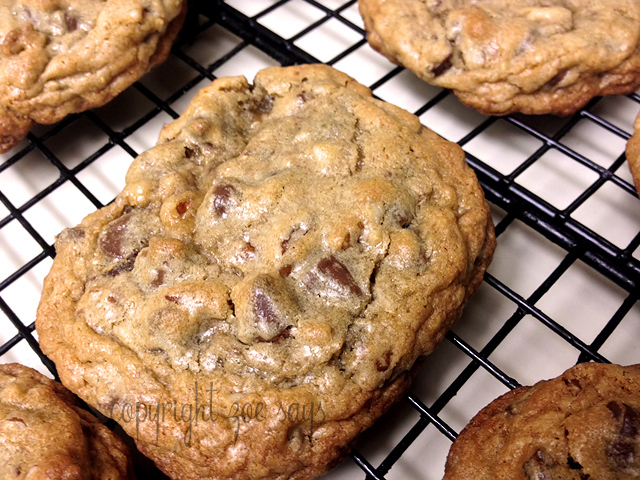 However, if you’re like me and still try the occasional “best ever” chocolate chip cookie recipe, read on. I skipped making Christmas cookies this year. To atone for that, coupled with several weekends of unsubtle nudging from my better half, I made this chocolate chip cookie recipe, courtesy of Dash and Bella. Less flour, a ratio of double the brown sugar to white sugar, and lots of STUFF in the cookies, namely extra chocolate chips and nuts. I usually don’t like my cookies with nuts, but since I was trying something new, I decided to go all in. I used chopped pecans instead of walnuts, and instead of using 1.5C of them, as the recipe calls for, I only put in 3/4C. For my taste preferences, that seemed to be the right amount of crunch and texture to add to a cookie. We only had semi-sweet chips so I wasn’t able to try the large bittersweet chips, but that’s for next time. Otherwise, I followed the recipe to a T and they really came out…..well, indescribably good. One of the more unique tips is making larger cookies that brown on the edges and you pull them out whilst still raw in the center. The idea is you let them cook on the sheet outside of the oven for two to three more minutes, then transfer to a cooling rack. It’s HARD not to want to eat these when they’re still gooey, but they do require a little extra time to firm up. 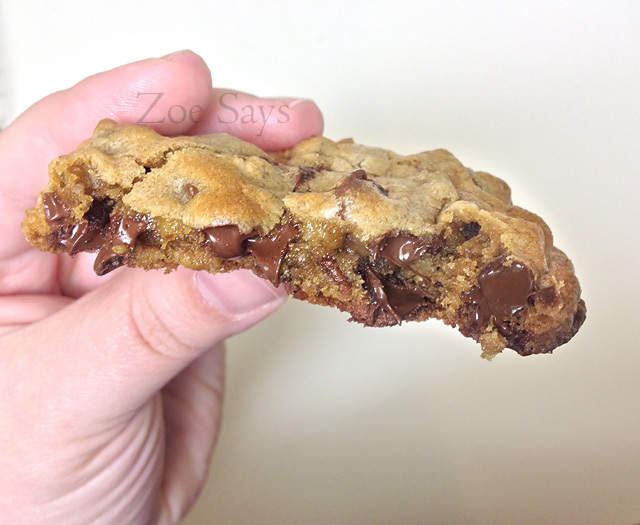 Then you get that delicious light crunch from the browned edge and the soft, oozing-chocolate middle. I need a glass of milk just describing them. 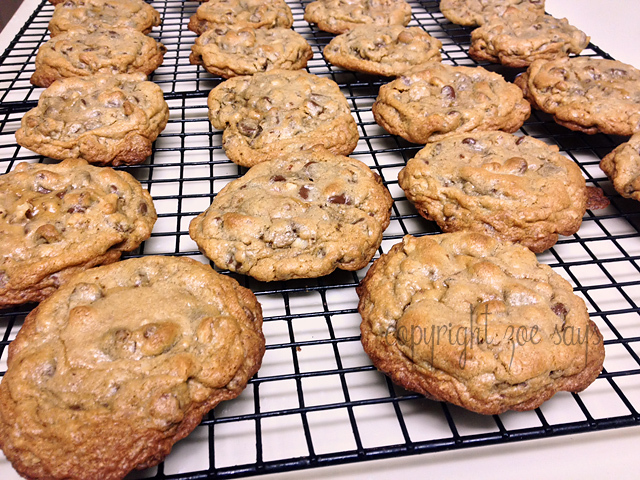 My results yielded fewer than two dozen large cookies, courtesy of a quarter-cup measure. The parchment paper is a must and makes cleanup a breeze. The recipe/author encourages tweaking this to make it your own, so you, too, also, as well have the Best Chocolate Chip Cookies Evar. Now away with thee so you can try them! Man, those cookies look delicious. They’ll get me in trouble because I love milk, and those cookies look deserving of several glasses. Thanks for sharing this! Absolutely! We rarely keep drinking milk in the house, so we basically had it on hand for just such an occasion. You will need it!